When the tall spires of the goldenrod plant begin to boast their yellow blooms I know we are immersed in my favorite season of the year. Goldenrod flowers mean long days, hot weather, and plenty of swimming in the wild lakes and rivers. Just this past weekend we floated down the Methow River and spied many tall spires of goldenrod overlooking our passage. Goldenrod plants grow all over the world and most goldenrod species are probably medicinal in some respect or another. In this monograph we’ll be looking at the main solidago species. Use your local field guides to find out what is growing near you. 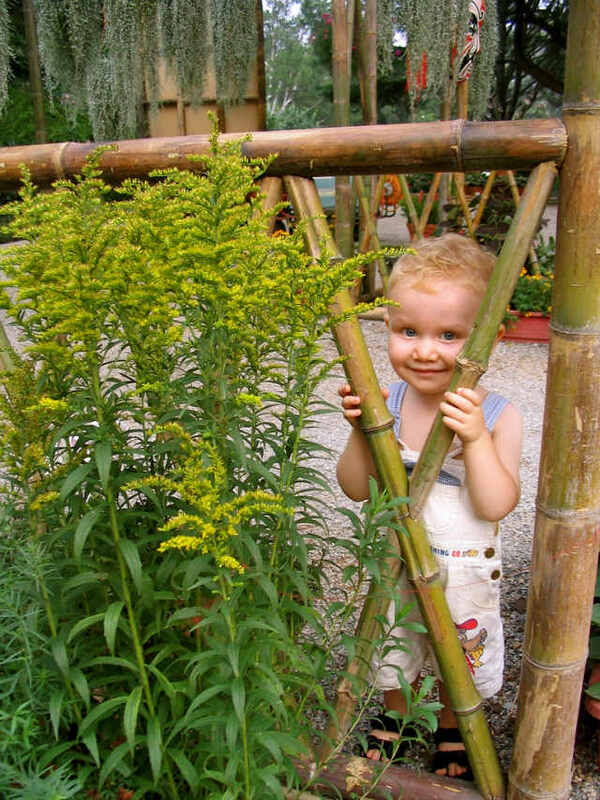 Let us know about your local goldenrod plants by posting your experiences in the comments section below! Goldenrod has a long history of use for the urinary system. It has been used for urinary tract infections as well as for strengthening the kidneys. Goldenrod is both astringent and antiseptic. 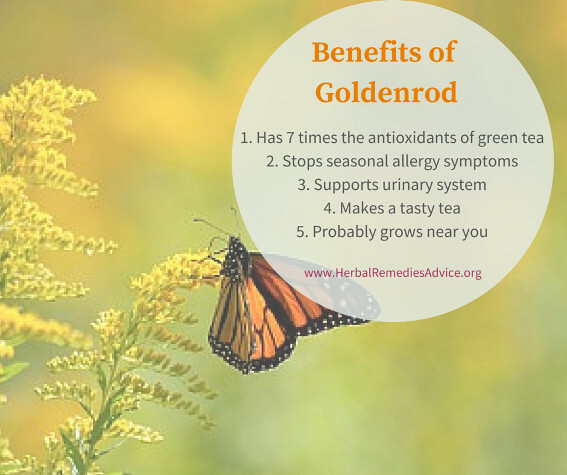 By tightening and toning the tissues of the urinary system, as well as providing action against bacteria, goldenrod is well suited to addressing bladder and urinary tract infections. Many of the older herbal literature sources cite it being used for kidney stones and it is still being used this way today. The German Commission E has officially approved goldenrod for the treatment of bladder and urinary system inflammations. Meanwhile, Goldenrod is one of the very few known trophorestoratives to the kidney organ. In any chronic kidney condition, this remedy is an indispensable asset and should be used long term. Another area that goldenrod shines is for allergic rhinitis or seasonal allergies. I use it in many of my seasonal allergy formulas (often combined with peach and plantain) and have seen it completely eliminate the itchy red eyes, runny nose and excessive sneezing symptoms for many people. Goldenrod also works really well for cat dander allergies. I suggest that people keep titrating up the dose until relief is found. Matt Wood recommends it in small drop doses. 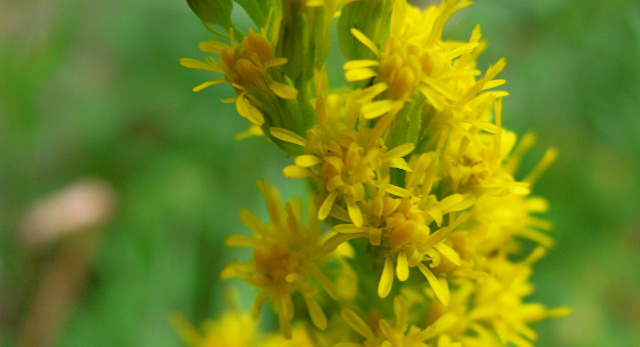 Many people despise goldenrod and blame it for their fall sniffles. However, the more likely culprit is ragweed or Ambrosia species. Goldenrod is pollinated by insects, not by wind. As a result, its pollen is heavy and sticky and does not readily float through the air and thus into people’s noses to cause the offending symptoms. I recently asked herbalists what they thought of the goldenrod allergy controversy. Most agreed that goldenrod does not overtly cause allergic reactions, although Nicholas Schnell felt differently. I’ll include his words as a caution and I’d love to hear from you in the comments section if you personally have experienced overt allergic reactions from goldenrod. In recent times goldenrod has gained popularity for relieving many different aches and pains, from chronic arthritis to acute injuries. It can be infused into oil and rubbed into the painful areas for this purpose. Goldenrod relieves most muscle aches. Try it for pains nothing else has touched. Give the oil a try for itches and swellings, too. You can buy goldenrod in bulk from my affiliate partner, Mountain Rose Herbs. Antioxidants are often called the key to good health and longevity. They can rid the body of free radicals, thus reducing the oxidation of our cells. This process is often blamed for the aging process. Have you tasted goldenrod tea? It is a very tasty tea, slightly sweet and astringent with a hint of volatile oils. A tasty treat with a higher antioxidant level than green tea! 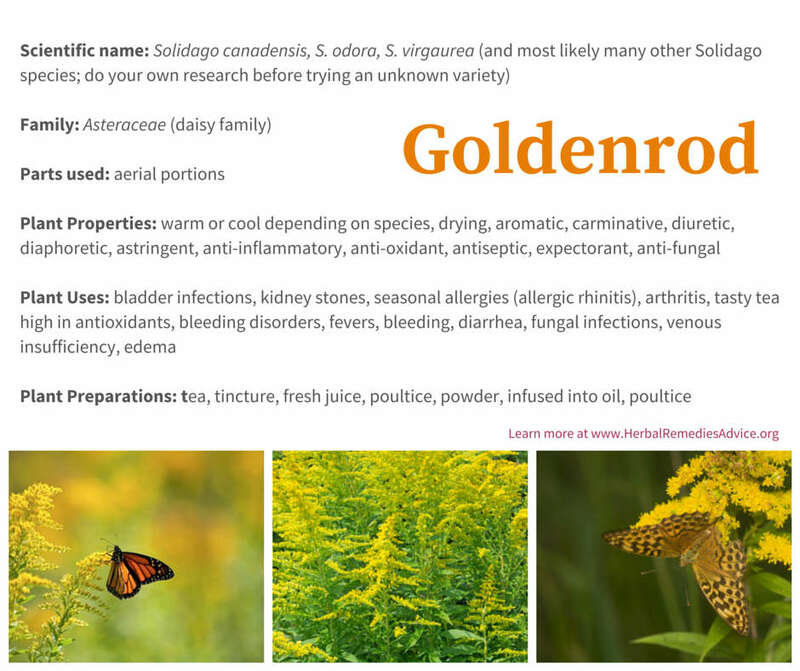 The name solidago means “to make whole.” Historical references site using goldenrod poultices for healing wounds and for use on burns. 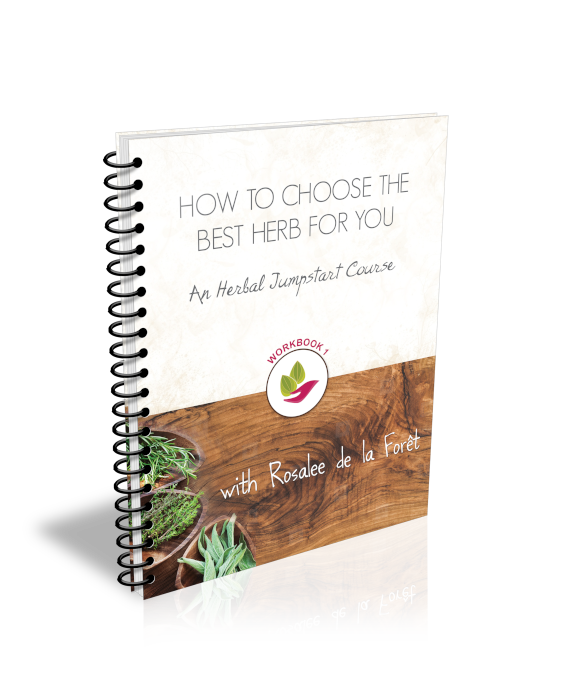 I don’t see a lot of contemporary herbalists using it in this way and it seems like a great avenue to explore. 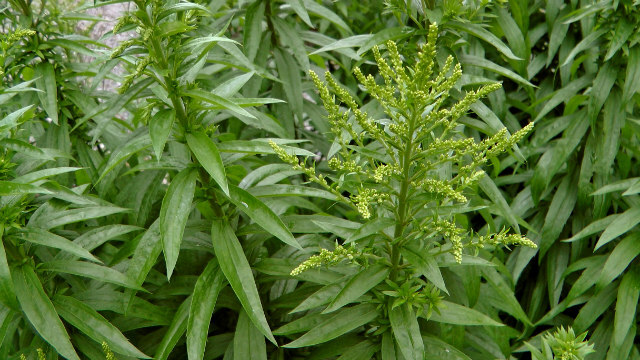 Goldenrod has many actions that are beneficial during a cold or flu. It is a mild diaphoretic, helping to open the pores and release heat through the skin and therefore can support a person during a fever. As an astringent and antimicrobial it can soothe a sore swollen throat – try it as a tea or infuse the fresh herb into honey. It also helps to break up excessive and stuck mucous in the lungs, which can then be expectorated and expelled out of the body with more ease. The plant contains saponins that are antifungal and act specifically against the Candida fungus, which is the cause of vaginal and oral thrush. It can be swished in the mouth (in the case of oral thrush) or used as a sitz bath for vaginal infections. For non-allergy related chronic yeast infections I have found it of moderate use, and its effect is greatly enhanced by Bee balm and/or Alder (Alnus spp.). It also has a long history by indigenous North American people as a douche or vaginal soak in the treatment of infections, for general discomfort and preventative hygiene. While I am not a proponent of douches, I do think that herbal sitz baths can be extremely helpful in persistent, low-grade yeast infections. Another area that goldenrod is being studied is to ameliorate the symptoms of insulin resistance and diabetes. Some animal studies have shown it to be helpful. I mention this because it is an interesting new way that goldenrod is being used; however, keep in mind two very important things. One, studies involving mice do not indicate that the same results will be found in humans. And two, insulin resistance and diabetes are, most often, a disease of a poor diet and should never be treated without treating the diet first and foremost. Goldenrod leaves and flowers are used for herbal medicine. Harvest the entire stalks (leaving behind some leaves) just before the plant blooms. If you are unable to harvest goldenrod you can buy goldenrod at Mountain Rose Herbs. Goldenrod tea is a tasty and effective medicine. The longer you brew it and the more herbs you use the stronger the medicine will be. For a pleasing beverage start with 1-2 teaspoons of goldenrod leaves/flowers per 8 ounces of water. Increase the steeping time and dosage as needed. 1-3 ounces of herb can be used per day. For more diuretic properties drink goldenrod tea cold. For more diaphoretic properties and to promote digestion, drink goldenrod tea warm. Goldenrod-infused honey can be used for sore throats (or as a tasty treat). 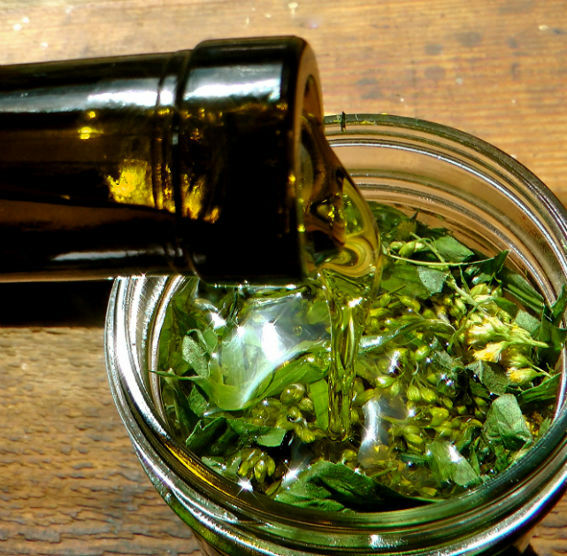 Try using goldenrod-infused oil for achy joints and more acute injuries. This could also be made into a salve or liniment. The entire plant can be tinctured as well. I often use the tincture for leaky, drippy, seasonal allergies and cat danger allergies. 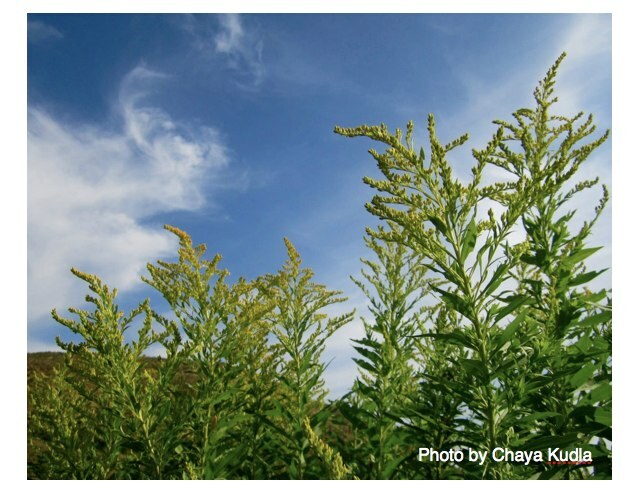 Susun Weed recommends making goldenrod-infused vinegar to "improve mineral balance, help prevent kidney stones, eliminate flatulence, and improve immune functioning." Some people may have an adverse reaction to goldenrod. It’s always best to consume small amounts when trying an herb for the first time. There are over 100 species of goldenrods (Solidago spp. ): Solidago virgaurea, S. canadensis, S. gigantea, and S. odora are all commonly used in a similar manner. Each species has varying degrees of qualities, however. One species may be more bitter than the next, or more astringent. Herbalists can’t seem to agree on whether or not goldenrod is cooling or warming and I suspect this also has to do with species variation. In my area the most common species is Solidago canadensis and so my botanical section will focus on that particular species. (Keeping in mind that exact taxonomy is difficult because of variations between species and geographic clines in characteristics.) Check your local field guides for specifics on the species growing near you. Canadensis is a perennial herb that can be grown easily from seed. It grows from rhizomatous roots and can reach up to 6 feet tall. It generally grows in clumps – which are often clones. If you hang out with goldenrod for very long you’ll quickly become acquainted with the goldenrod crab spider. This spider turns yellow or white depend on which flower it is inhabiting. As you can see from the photo it is also a voracious hunter, often capturing and devouring insects three times its size. When I harvested goldenrod this summer I shook out at least five goldenrod crab spiders! Special consideration should be given to the variability of the flavors and scents within the great many spp. of Solidago. If you have multiple species near you (and you probably do) take the time to taste the leaf and flower of each kind, and get to know the subtle differences. The most aromatic tend to be more helpful for mood elevation, kidney problems and external use, while the more bitter or bitter/aromatic spp. are especially nice for digestive issues and the astringent/aromatic types are great for upper respiratory issues and general mucus membrane over-secretion. These type of subtleties apply to all herbs, but Goldenrod tends to be a great example of it because of the many spp. and sensory variances even within a single species or subspecies. 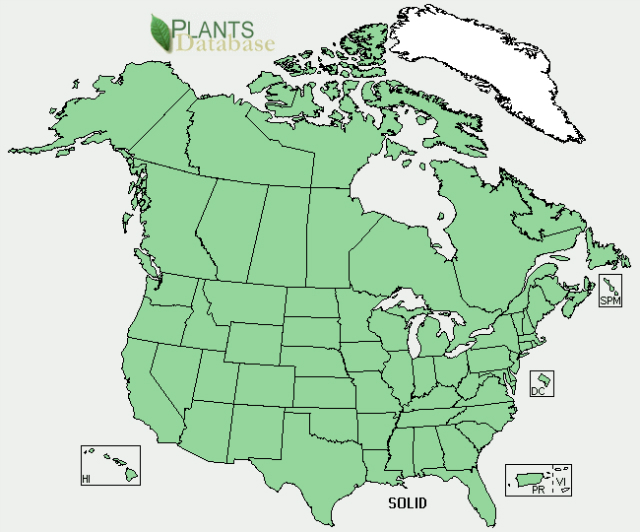 Here is a range map of where the Solidago species grow in the US. Goldenrod is a delicious edible. The flowers can be fried up as fritters (similar to elder flower fritters) and the more mild tasting leaves can be cooked and eaten as well. Goldenrod is plentiful throughout North America and offers a plethora of healing virtues. Its golden torches announce the height of summer and remind me to savor the moment and appreciate all the green-growing things that will soon be entering a winter's slumber. Goldenrod tea is tasty and full of antioxidants, the infused oil is great for painful joints, and the tincture can help stop a hay fever reaction.... certainly an important plant to grow your herbal knowledge. 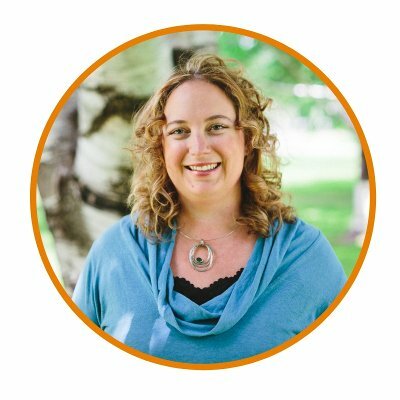 This article was originally published on HerbMentor.com.